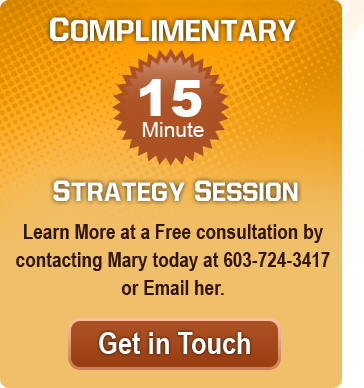 On your initial visit to Mary, you’ll discuss your specific set of issues and concerns. Mary will determine from that interview what treatment technique, or combination of techniques – Hypnosis, Neurological Linguistic Programming (NLP), Emotional Freedom Techniques (EFT) and Time Line Therapy® – presents you with the best opportunity to quickly achieve your goal of a more fulfilling, less stressful life, without the long time commitment of traditional therapies. Be aware, Mary is flexible. It’s not about a specific treatment technique; it’s about using a combination of techniques that give you the tools you need to achieve the emotional wellness you seek. Setting goals, taking action, making better decisions, and using your natural strengths: we all want to create a life and career we love and find fulfilling. By listening, observing, and providing feedback, Mary guides you, customizing an individualized strategy that will help you more fully realize your potential in virtually every area of your life, from the personal and professional to your health and finances. Be assured, you do the work and take responsibility for your journey, tapping into your inherent resources and creativity to achieve the life that until now you’ve only thought about. Hypnosis, reaches that state between the conscious and the subconscious mind where memories are more easily accessible and new information more easily assimilated. It stops your critical and judgmental mind from shutting out positive suggestions. This opens the door for you to receive the help you need to carry on more effectively and be more fully engaged with those you love, with your work, and with your life. In short, it helps you to be your best self. Hypnosis has been clinically tested and shown to rapidly achieve demonstrable results in reducing pain, anxiety, and stress – triggers that can cause an emotional paralysis that leaves you virtually unable to function. Mary is a member of the National Guild of Hypnosis in 2006 and is American Board Certified in Hypnosis. NLP is the science of reaching excellence. Anger, fear, sadness, conflict, and guilt are all emotions that can be triggered by events from our past we just can’t seem to get beyond. They negatively affect how we view ourselves and prevent us from making positive decisions that can help us realize all the wonderful possibilities life holds for us. By first visualizing (the Neuro) our goals and the behavioral model we want to live by, then finding the words and images (the Linguistic) that help us to verbalize and visualize that model, and finally to make these new behavioral patterns habits (the Programming) is how NLP can help us achieve a sense of balance and self-worth we had only imagined. And it accomplishes all this quickly, without the long time commitment most traditional therapies require. Mary has a Masters in Neuro Linguistic Programming (NLP) and is American Board Certified in its treatment and as an NLP coach. Post Traumatic Stress Disorder (PTSD), abuse and abusiveness, and compulsive behaviors can often be more effectively and expeditiously treated with a tool – EFT – that joins two sciences: Mind Body Medicine and needleless acupuncture. Acupuncture for your emotions, this alternative therapy has you focus on emotions connected to the traumatic event while you tap your fingers on preset acupuncture points. This technique allows you to let go of those triggers that have created your negative thinking and behavior. And because these emotional triggers are often the source of illness and dis-ease, EFT has proven to often relieve physical symptoms, returning you to a more balanced frame of mind. Mary studied Emotional Freedom Techniques (EFT) in 2007 and been successfully incorporating it into her treatment protocols since then. It is possible to experience positive emotions and make decisions that empower you in positive ways. Time Line Therapy® is a fast and effective means of getting in touch with the chain of events that has lead you to feel internal strife and behave in ways that make you unhappy. By looking at the emotional timeline of our lives and examining how those emotions have led us to where we are today, we can jettison those that are negative and stop making decisions that ultimately limit the joy we deserve to have in our lives and to begin setting smart goals for our future. Mary is a certified Time Line Practitioner.